But you should know I often have to be tricked into spending money. Like, I mentally compile a cost/benefits analysis for just about any purchase over $20. So when Natalie told me that every month she checks into a hotel for a two day writing and work retreat I was simultaneously intrigued and put off. But then I had a free Sunday night. You guys? I’m going to do this at least once a quarter for the rest of my self-employed life. In a 36-hour period, I wrote two months of blog posts. I analyzed my revenue streams. I got clear on which tasks, habits, and post series I should drop and which ones I should bolster and improve. I created an incredible amount of psychological and editorial breathing room for myself. And I did it all for $60 (plus tax). 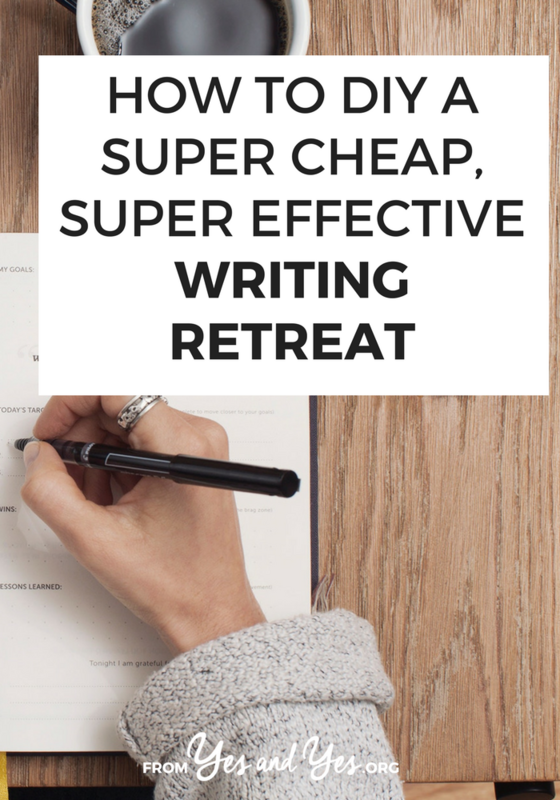 Want a DIY writing retreat for yourself? You don’t want to waste time and energy searching for a Kinkos in a strange town or fussing with corrupted files. I think this bit of preparation also helps you take your retreat more seriously. A few (free) planners and workbooks that might help: Kyla Roma’s Website Clarity Workbook, Maria Ross’s 9 Days To A Better, Tighter, More Lucrative Brand Plan, Shareaholic’s downloadable editorial calendar template. I have a physical folder (how retro!) of magazine clippings that inspire me or images that light me up. Get all your inspiration in one neatly organized place so you don’t waste time hunting down That One Article From Real Simple or that very important post-it note. Use Word or Google Docs to create a draft of every single document you want to write. This could be a super rough outline or just a title and an empty document. Either way, it will help you stay on task and remind you of what you wanted to be working on. This seems like a weird detail, but I find that it’s important to leave the city and be in the car for a significant amount of time. It really helps me extract myself from my day-to-day mindset. I make it into a mini road trip with gas station coffee, car snacks, and podcasts. You don’t want to be distracted by brunch invitations or client emails during your allotted writing time. When I’m tucked away and writing, my dude and I forego our nightly check-in calls and everyone who emails me receives a polite “I’ll get back to you soon” auto responder. If you can resist the siren song of Facebook, you are a stronger human than I. I do my best, fastest writing when there are no distractions, so I don’t even ask the front desk for the wifi login. If you’re super, duper serious you can even leave your phone in the glove compartment of your locked car so you won’t be tempted to fall down a social media hole. No editing. No photo sourcing. No headline analyzing or a/b split testing. I like to use this time to bang out rough drafts filled with typos and questionable introductions. My edits are better when my first drafts have had a chance to age and cure; it’s freeing to write without too much concern about sentence structure. I like to treat myself to a nice dinner, work through a bit of yoga, or experience that hotel water pressure that’s a million times better than my apartment’s. What you probably shouldn’t do on your break: check your phone or watch three hours of tv. I emerged from my retreat pretty exhausted, but proud of myself. I honestly can’t put a price on the peace of mind that comes with two months of scheduled posts. Have you ever been part of a retreat – DIY or otherwise? Do you think you’d be willing to splash out? If you know of any other free/cheap resources that would be useful a retreat, leave links in the comments! P.S. Did you know I have a whole Pinterest board devoted to writing and creativity? Click here to follow along! Why You Should DIY A Creative Mastermind Retreat + A FREE step-by-step plan for how to do it! Love it! I’ve been known to book myself a room in Minneapolis when I want to do what I want when I want. Sure there are friends I can stay with, but its freeing to text whomever I choose and ask them if they have free time right now for a drink or a walk, instead of mentioning that I’ll be around in a distant weekend. Two years ago my weekend away included drinking champagne in my pjs watching old movies, this year it involved multiple drinks and an early early morning walk home. Both were completely satisfying in completely different ways. There’s a (cheap!) book on how to make your own writing retreat. A friend bought me a copy and I love it. It’s called “DIY Writing Retreat.” I liked Alicia’s suggestion of getting a train ticket (like the Acela from NYC to DC) and riding it for a few stops while you write. Get out, go for lunch and sight see for a bit. Hop on the train again and head back home. You don’t have to pack an overnight bag! So glad this was the nudge you needed! Fab advice! Looking forward to planning my own! This had never occurred to me, but I love it! Sometimes what you need is to get yourself into a headspace where you plow through to a goal (kind of like gearing up for finals, you know?). Getting into that mental space is often spurred on by a physical one. Great post! This would be smart for a teacher too! Quiet time like that could help me bang out curriculum outlines pretty quick. This sounds honestly heavenly. My own version, coming up: this summer, once school gets out, I’m keeping my kid in daycare for two more weeks and going into my classroom anyway for 8 hour days. I’m already salivating at how much I can get done (planning and organization wise) with that much alone time. Last year, I was pregnant and about to pop at that time, and I still got a whole bunch done. I can’t even imagine now, when I won’t be exhausted and can bend over to sort and file papers and organize cupboards. Such a good idea, Leah! My parents were both teachers and I know they would have loved this! This sounds like such a good idea – I’m going to have a look at doing this 🙂 I love the fact that you’ve now got two months of posts written – how awesome is that?! Okay…THIS is genius!!! As a Designer, I easily get distracted when I’m in my studio; which is terrible because it’s supposed to be where I am at my best. Step one, plan myself this getaway retreat. Step two, remove distracting things from my studio so I can breath in there and bring a little “retreat” home with me. I don’t know of any cheap resources for writing retreats but a couple years ago I volunteered on a guest farm out in the middle of nowhere at the foot of a mountain and it was so peaceful and tranquil that I thought to myself, this is a perfect place for a writer or artist retreat. Watching the goat herd graze across the property and the coming and going of the farm staff and animals with not a sole in site for days and a half hour drive to the nearest town. Magical! What a great idea! I think you’ve just summarized what I’ve been thinking of doing a lot lately…and this is a much easier way than what I had in mind (which wasn’t anything too specific yet haha). Thanks, Sarah! I used to do this in college, sorta. I’d hole up in my house with lots of chocolate and chain myself to the keyboard to finish rough drafts of assignments. Then I’d spend the next few weeknights revising . Thanks for reminding of that — it did work well. This is awesome! My grandmother and I had Internet troubles during the last week of March. Annoyed, I played a lot of Sims 3, watched DVDs I’ve had on my laptop since about 2011, and tried to will the Internet back to life. Eventually, I sucked it up and just let things happen, and I wound up shelling out around three or four posts for my cousin’s blog, which is a lot more than I would have had I had Internet to work with. I’ve been wanting to stay in a hotel for a “workcation”, as I see many bloggers talk about. I feel like time away from the distractions from family could really help me, even if I did have Internet, because when I’m this close to them, I’m literally more likely to drop everything and answer their beck and call… and it just seems fun to sort of go someplace and not be in the same place for a change! As a homeschooling mother, I try to do this every summer! It’s amazing how quickly I can work, plan, dream, and create when I am alone and not distracted. I have used local friends’ homes who are on vacation, Christian retreat centers, and Hotwire is my go-to as well for last minute deals. I *really* need to do it quarterly! I love this idea and your points are spot on. The only issue I have is the disconnect. I’ve learned a few things as a widow who now travels alone most of the time. Women, and even men, in this day, do not ever need to be out of contact from their families or someone close to them. The unfortunate truth is that it is a dangerous world and phones should be on your person, not in your car (which can be stolen) or turned off. If you are in an unfamiliar location, you do not know what dangers may be right outside the door, no matter how nice the hotel/motel. You’re own health issues and possible family emergencies are also a factor. Always tell your family where you’ll be staying and how to reach the hotel. Also, if you don’t generally use GPS, turn it on when traveling alone. This may be what leads the police to you in an emergency. “Be safe” is a priority anytime you travel alone. Great post, Sarah. Some really good information and ideas. Many thanks for letting me share your blog post. I need to do this. Thank you for sharing. My dream has been to rent a cute home out for a night or two through Air BnB for my birthday coming up. Pack all my props, outfits, laptop, camera… take creative self-portraits, lifestyle photography, and plenty of writing! My life isn’t set up for me to do that anytime soon, but I KNOW the time will eventually come and I’m excited for it! I’m a caregiver at 27 and have never been alone or out on my own. As an introvert, I can’t wait for the day to just be able to insert breaks from human interaction. Haha.